A new virtual photomosaic globe with nomenclature has been published in the Virtual Globes Museum maintained by the Department of Cartography and Geoinformatics at Eötvös Loránd University, Budapest, Hungary. Three maps were created for the virtual globe: a Plate-Carée map of the lower latitudes, and azimuthal equidistant maps of the polar regions. It’s labels are designed for a 1 : 100 000 000 scale and a corresponding print size of 13 cm in diameter. The globe was created and processed by Zsófia Merk, Mátyás Gede and Henrik Hargitai . 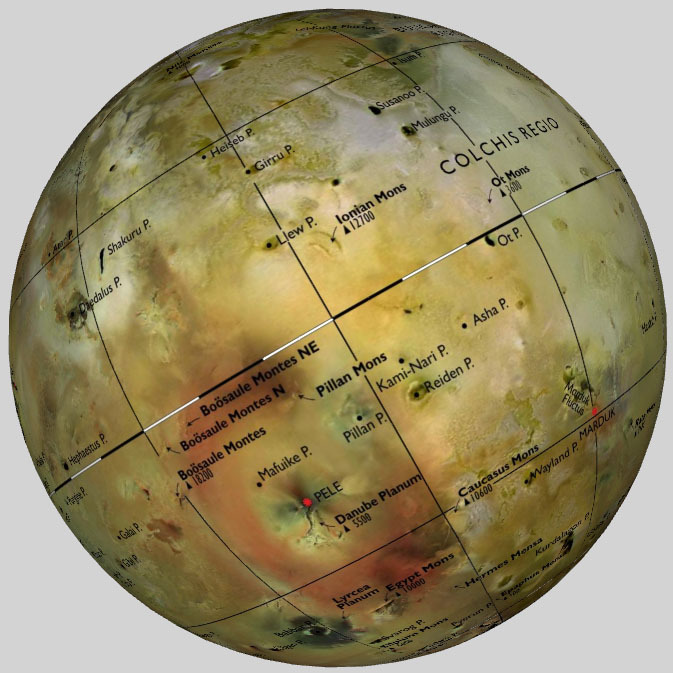 For the base map, Steve Albers’ (2006) photomosaic was used, height data is from the Io Mountain Database (courtesy of Paul Schenk and Henrik Hargitai, 2001). The globe can be viewed online, or can be downloaded as a Google Earth add-on.